I go through dozens of Grandma’s collected pieces of china, each one delicate and fine. I scour the internet for details on the precious china & glassware, and what I find makes me gasp. Each piece is worth actual dollars! Some pieces are worth several actual dollars! The day I loaded her white Haviland china into the back of the minivan, I drove almost as carefully as the day we brought home our son. As I set each piece in its new home in my cupboards, I pause to really look at them. Light and tiny but very much present atop of plates are lines where knives scraped across them decades ago. ‘She actually used these!’ I marvel. I am guest posting at (in)courage today for the Bloom book club! Click over to read the rest of the story. We’ve been reading through Shauna Niequists ‘Bread & Wine‘ this summer, and I am just.so.happy. that this was our summer read. It’s been a joy! Do you have any special dishes or heirloom pieces that are dear to you? What do you serve your meals on? 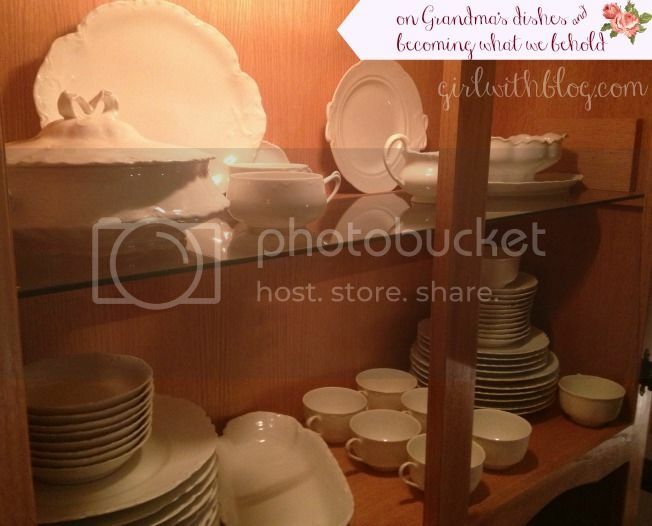 This post makes me realize that I need to get out the good china, and use the silver, and perhaps I’ll pull it all out for our In(RL) potluck in a week. I think it would make the whole thing far more beautiful. I LOVE those dishes!! Most of my grandmother’s dishes were lost in a flood… all the boxes got thrown away without being gone through. We didn’t realize until later that some of those precious things that could have been saved were lost. I too have inherited dishes with stories to tell. I’d like to create a collection of photos of each and write down the stories I’ve been told so future owners will know. When my daughter receives the beautiful crystal serving dish, I want her to know it was a wedding gift to her grandparents, who were married 64 years, and that the ornate ice bucket with the dainty tongs belonged to her great grandmother on my dad’s side, who lost her husband in a car accident in the 1940s, and was still hospitalized with injuries herself on the day of his funeral. To me, the stories make the pieces all the more valuable. And yes, in my family we still use them – not every day, but often.